The rainy season is definitely here, and you know what that means: staying indoors. But just because your child is stuck at home, it doesn't mean he can't have fun – or keep learning along the way. Check out the different types of activities below, perfect for helping support your 4- to 5-year-old's brain development. 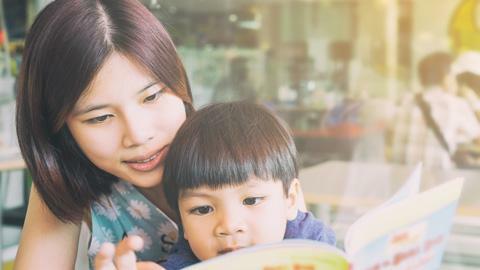 Build on your child's ability to understand and respond to two-step instructions ("Please bring me your book and put this in the trash on the way"), by encouraging him to explain the steps he uses to do things. As the rain pours outside, you can get your child interested in planning what he can do in the meantime. Ask him to help you make lists of what you need for a craft to do in the afternoon, a game you can play together, or even an event to look forward to on a sunny day. When your child asks you a question you don't know the answer to, say, "Let's look it up." Find a book on the subject or search online. Four-year-olds often show a lot of curiosity about big topics like death, space, weather, and the prehistoric world. Keep plenty of art supplies on hand. Especially popular with preschoolers are paper collage (using colored paper or magazine images and child-safe scissors), clay sculpture (using supple clay or dough, molds, and tools), and easel painting (with fat-handled brushes). You can even download printable crafts. Now that his fine motor skills and hand-eye coordination have improved, your child is ready to learn how to use a spoon, fork, and table knife correctly. It's likely to take a bit of practice before he can do it easily on his own. Chase the rainy blues away with a happy song. Get your child on his feet as you both sing and dance to his favorite hits. He can even pick up instruments and play along. Mommy blogger, Louise of Mommy Practicality points out that not only is it entertaining for the whole family, but it also lets him use his time productively and practice his skills. Even as your child grows bigger and becomes more independent, your touch will always be reassuring and give him a sense of security. If your child hits or throws things in anger, hold him firmly yet calmly, so he can regain control of his emotions. Let him know that what he's doing isn't acceptable. When he's calm, you can talk about other ways he might vent anger and frustration, such as pounding a pillow, running around the yard, and expressing his feelings with words. Playing indoors means scattering toys around. Set a timer for, say, three minutes, and see how many blocks your child can pick up in that time. Kids like to be helpful and contribute to the household; the best way to instill the habit of picking up after themselves is to make clean-up an enjoyable part of playing. Let your child know when he has behaved well. Your loving words and hugs are all he needs for positive reinforcement. When you're reading a story together, keep your child engaged by asking questions: "Why did the dog run away?" "Where do you think he went?" "What do you think will happen next?" When your child draws a picture, encourage him to tell you what's happening in it. Write down his words and read them back to him. You can also make up your own stories (or re-spin a classic fairy tale), featuring your child as the main character in a great adventure. You might offer an installment each night at bedtime, and invite your child to add to the story. Don't get too worked up if your child picks up and uses curse words. Swearing is a normal type of imitative behavior. But if you make too big a deal out of it, you risk giving the words even more power and allure. Better to matter-of-factly say that's not a nice word to use and move on. • American Academy of Pediatrics. Caring for Your Baby and Young Child, Birth to Age 5. 5th ed. Negotiate the Major Developmental Milestones. • American Speech Language Hearing Association: Communication Milestones. • Louise. July 28, 2015. "Safe Indoor Activities for Kids This Rainy Season." Mommy Practicality.